The Temple Mount in Jerusalem has become the focus of much debate both between religions (Islam and Judaism) and between different segments within a religion (Judaism). At its core, the debate is whether the most fervent believers continue to dictate the religious practices of everyone at the Temple Mount, or whether there is a place for a pluralistic approach to prayer. The Temple Mount is a 35 acre platform built by the Jewish King Herod over 2000 years ago. The platform held the second Temple, built around 515BCE until it was destroyed by the Romans in 70CE. The site of the two Temples (the first one lasted from around 954BCE to 586BCE), is considered Judaism’s holiest spot. It is now occupied by the Dome of the Rock, a gilded shrine built by Caliph Abd al-Malik in 691, and later richly adorned in 1561 by Suleiman I into the building we recognize now. Al Aqsa is the only mosque on the Temple Mount. It is considered the third most holy site in Islam. It was built in its current configuration in 754CE, and sits on the far southern edge of the platform, in an area that did not exist until Herod expanded the platform southward 800 years earlier. In 1948, five Arab armies invaded Israel in an attempt to destroy the nascent Jewish State. Jordan seized Judea and Samaria and much of eastern Jerusalem including the Old City which contained the Temple Mount. The Jordanians then expelled all Jews from the territory it conquered (including the Old City) and the area later became known as the “West Bank”. In 1967, the Jordanians and Palestinians attacked Israel again and lost all of the West Bank including the eastern part of Jerusalem. Rather than take full control of the Temple Mount, the Israelis handed religious control of the Temple Mount compound to the Waqf- the Islamic religious order run from Jordan, and assumed security control. The Jordanians continued to prohibit Jews from worshiping anywhere on the Temple Mount, even in areas far removed from the Al Aqsa Mosque, such as areas Muslim families used for picnics and football. Many Jews are unhappy about the ban on Jews worshiping at their holiest spot on earth. People such as Rabbi Yehuda Glick made many arguments to Israeli authorities to loosen the anti-Jewish restrictions. For those efforts, he was shot in October 2014 by Palestinian Arabs after acting-President of the Palestinian Authority Mahmoud Abbas, incited his followers to “defend Al Alqsa by whatever means possible”, even though Jews who visited the Temple Mount never entered, nor attempted to enter, the mosque. at a hotly contested religious site in Jerusalem was shot and seriously wounded Wednesday night by an unidentified assailant in an apparent assassination attempt. 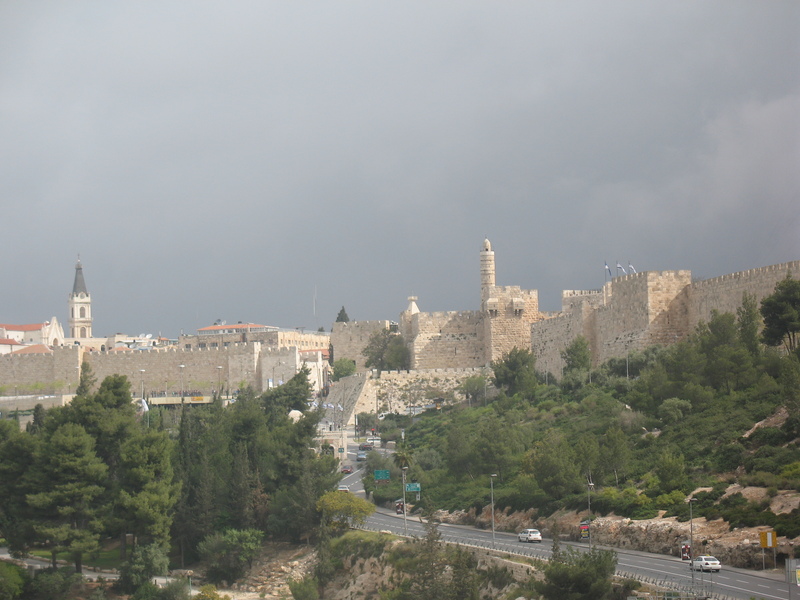 Glick was not alone in seeking greater religious rights for people in Jerusalem. The “Western Wall” or the “Kotel” is part of the western retaining wall that Herod built to increase the size of Temple Mount. 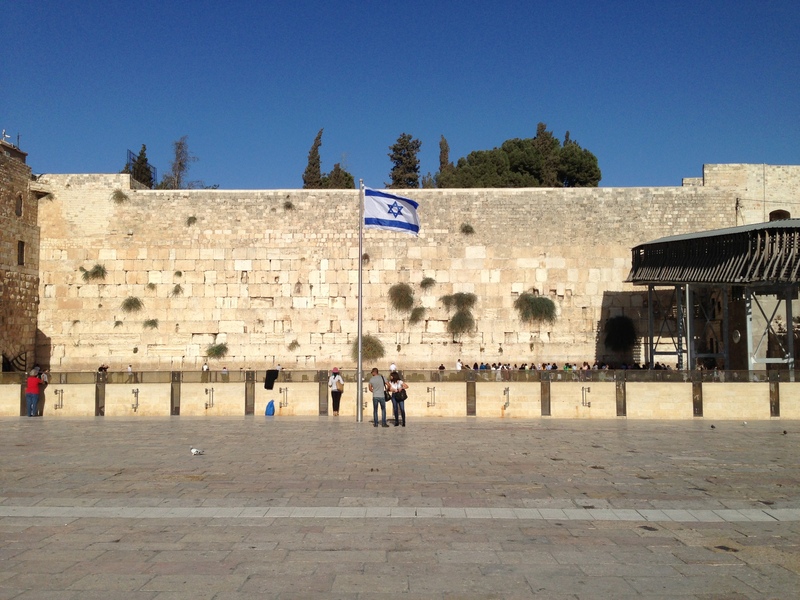 For many centuries, the Kotel was one of the areas closest to Judaism’s holiest site, which Jews could access. While several other spots on the retaining wall were closer to the site of the Jewish Temples, they were either very small, hard to access or considered unsafe. As such, the Western Wall achieved the status of Judaism’s holiest site because Jews could practically use the site for prayers. After Israel reunited Jerusalem in 1967, it demolished the buildings in front of the Kotel and made a large plaza where thousands of Jews could pray. It gave religious control of the plaza to the Orthodox rabbinate to oversee religious activities. Those rabbis have restricted prayers to only be in the orthodox tradition. 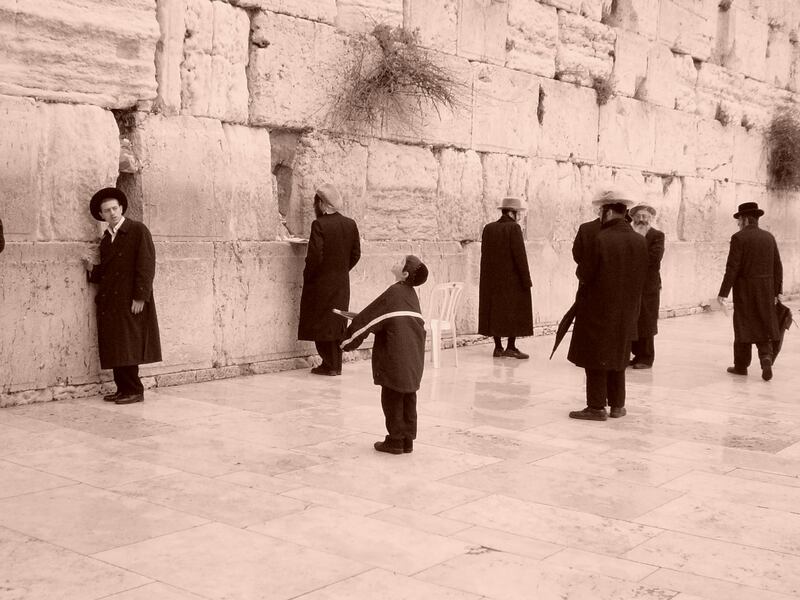 In 1988, a group of feminist Jewish women who objected to the restrictions of the Orthodox rabbinate, formed a group seeking the right to pray at the Kotel in a manner of their own choosing. The Women of the Wall (WOW) were predominantly “progressive” orthodox women that believed that women wearing a tallit, tefillin and using a Torah were “kosher” actions under orthodoxy, if they prayed only with other women. However, the Orthodox rabbis use a more traditional approach to prayer and have established laws which prohibit those women from praying in their desired fashion at the Kotel. In October 2014, WOW brought a miniature Torah to the Kotel and held a bat mitzvah on the women’s side of the plaza. The rabbis did not attack the women but stated that they will seek to prevent women from holding such services in the future. that was read with a magnifying glass for the ceremony. Does liberal support of activism end when it elicits violence? Should Malala Yousafzai, the young Pakistani woman who defied Taliban law to not attend school, be described as an “agitator”? The world embraced Malala and awarded her the Nobel Peace Prize in the same month as the Glick shooting and WOW bat mitzvah. Will “progressives” and “liberals” rally to Rabbi Glick and advance the cause for Jewish rights on the Temple Mount? What do you think? 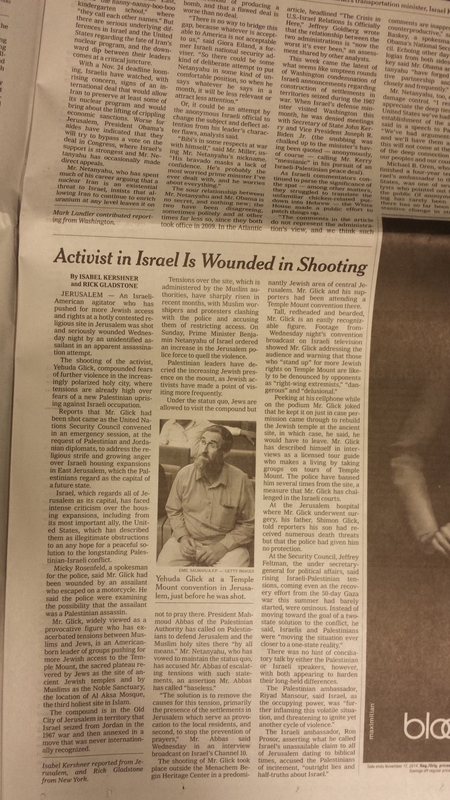 This entry was posted in Israel, Jews, Judaism, Middle East Analysis, New York Times, Palestinians and tagged Abbas, Jerusalem, Kotel, Temple Mount, Women of the Wall, Yehuda Glick by First.One.Through. Bookmark the permalink.